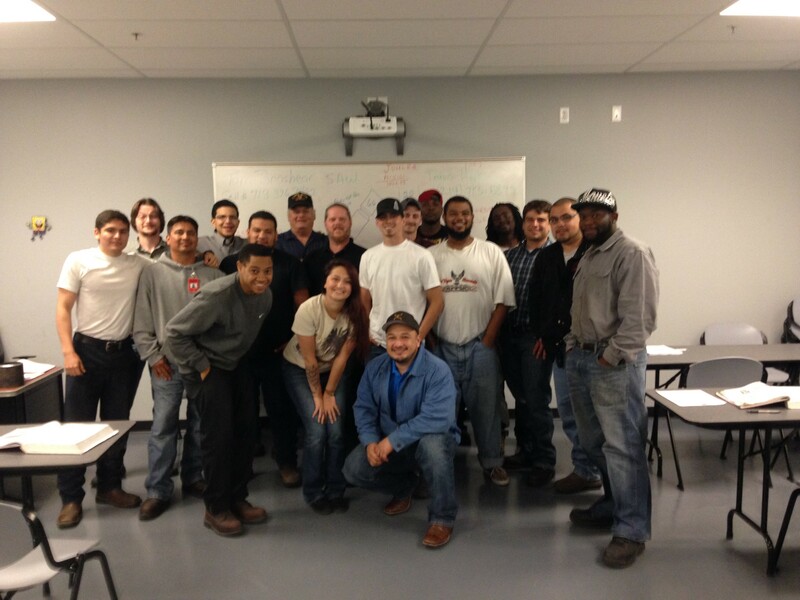 Tom Brashear, welding instructor at Tulsa Welding School – Houston, joined our new Texas campus in January this year. Houston is home for Tom, and when he’s not teaching, he enjoys inventing machines for welding processes. How long have you been a welder Tom? How did you discover the trade? My ex-father-in-law. I married a welder’s daughter. 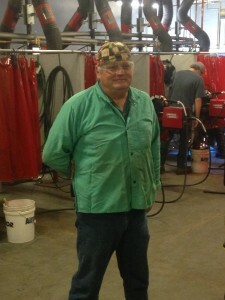 He talked me into the welding field and the career lasted longer the marriage! I started in a union welding shop. I welded there for about 7½ years until they closed; I spent the last 3½ years welding pipe for nuclear power houses. Is TWS your first formal teaching job? In the mid 90s I taught at a welding school for a year. But it wasn’t quite as structured as this school. So what brought you back to teaching and to TWS? About three years ago, the company I worked for had a reduction in force and I got caught up in that. I have my own side-business, welding exotic metals, making machines and consulting, which was going fine until drilling slowed down because 90% of my work was in drilling. So my income dropped and I had to go back to work. That was about the time that this opportunity became available. So far I’ve taught what I call the “kindergarten class”. It’s the introductory class and we have some students who have never seen an arc before. It’s fun to take someone like that and get them to a place where they can perform a good, sound weld. It’s certainly been enjoyable. I love sharing my knowledge with people who really want to learn. I never could figure that out, and I still haven’t at 64… I’m just not planning on growing up! I guess it was more of an assumption thing to be honest. My dad had a trucking business so I assumed that I’d do that with him. But when I got drafted into the army, it kind of broke the umbilical cord. I had two years active service, and a year in the reserve. When I came back I got married, and that was when my new father-in-law pushed me into welding. We rescue dogs, no particular breed, just whatever needs rescuing. We try to keep them off the road so they don’t get mashed. We have eight dogs at the moment. Also I do like to fish; I don’t know if many people here know that about me. My wife, Pamala, is my fishing buddy. I like classical music. My friends tease me about that, they tell me I’m listening to elevator music! Movies: That’s going to be difficult to answer because I love movies, I’ve got over 1000 in my collection. If I had to pick one, I guess I’d go with Down Periscope starring Kelsey Grammer. That’s a very good comedy; it gives me a pretty good laugh when I need it. I’m not much of a reader to be honest. My wife’s a big time reader, and she’s been trying to get me into it…so I just have her read to me! I just kind of like having dinner with my wife! But if you’re going to make me choose someone else, I would have liked the opportunity to sit down and pick the brains of Roman Arnoldy. He started the Triten Corporation in Houston, which was one of the companies I’ve worked for. I enjoy building machines for welding processes from ideas in my head. This man was somewhat similar, but he had a stroke shortly after I joined the company. Although I met him, and worked on some of his ideas and projects, I never had the chance to visit with him. He was creative, an innovator. He invented a particular type of process that wasn’t in existence. I think that would be an interesting evening. You mentioned your wife; tell me about your family. My wife Pamala and I are still on our honeymoon really, we’ve only been married 23 years! I have three daughters from my first marriage and a stepson. We have eight grandkids and one in the oven! I’ve always said that if I won the lottery I’d buy a big property and rescue dogs. Then I’d bring in homeless people to live there and take care of the rescue puppies. I’d tell them to be sure of what they’re getting into, and I mean the welding industry. Even though it’s a craft in high demand, and although it can be seen as glamorous, it’s still a craft that has some unfavorable sides to it, such as burns. Burns are inevitable if you’re a welder. I’ve had students tell me they don’t want to get burned, to which I tell them if you don’t want to get burned, then you don’t want to be in this craft. I don’t care how good a welder you are, that’s just part of it. There are plenty of upsides, like a good paycheck, but you need to be aware of all sides of any industry you get into. The creativity. I told you that I do build machines for automated welding on the side. When someone tells me they need a machine for a certain process or application, I can often see it in my head. I build it and when I see it work, it’s very rewarding to me. I built a machine that they told me was impossible when I worked for Triten Corp. But after I built it, they patented it, and use it in one of their processes. That would be a process. In the welding industry it’s known as GMAW which is gas metal arc welding. In the welding world I came up in, it was called short arc. It’s a tool to put metal together, so although it’s a process, it’s also a tool. My father, Thomas Brashear. He passed away in 2000. He taught me to think, even though he didn’t like the fact that I didn’t think like him sometimes. I’ve always appreciated that he made me learn how to accomplish things by thinking them through. When I was a teenager if a problem arose and I asked him what I should do, he would always reply “What do you think you should do? Think for yourself, you can figure it out.” He definitely made me think more creatively, and I’ve always appreciated that. I’d get my wife and get on an airplane and go somewhere. I woke her up one Saturday morning around 9am. I told her she had to get up because we’re going to Outback Steakhouse. She said it’s 9am, to which I replied that we had a plane to catch. We’re going to the original Outback Steakhouse in Tampa, Florida, for dinner. I’m very impulsive! My wife always says – “You need to be a little faster, you’re the slowest person I’ve ever seen.” So I guess I’d like super speed!